Stunning…that’s all I can say about the work of the French studio Teo Jasmin. Using photographs from the turn of the 20th Century, Teo Jasmin employs a special technique transferring photos to cushions, canvas, and furniture, and creating modern works of art. Blending traditional photos with cutting edge techniques, the effect is a truly modern piece sure to add something special to your home. 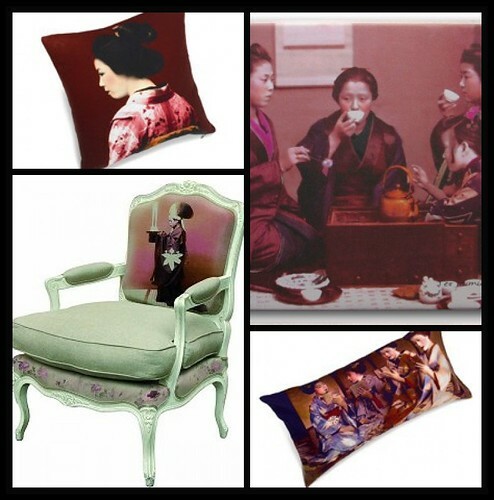 Reminiscent of Ibride trays, by applying photos to textiles each piece is able to tell a unique story – a Japanese geisha, the traditional tea ceremony, a circle of friends. A way to add just a glance into another time into your modern interior, Teo Jasmin offers special pieces capturing a single moment to reflect upon. While most items are sold in France, you can find Teo Jasmin cushions at The Conran Shop. A beautiful addition to any decor. The only justification is, if you love it, buy it. A pillow this gorgeous is definitely worth it.